Coffee Break Worm is a freeware remake of the classic arcade python-style game. The objective of the game is to eat as many fruits as you can. Download this fun coffee break game now. . .
River Raider is a fresh remake of an old action game that brought you much pleasure a long time ago. Staggering gameplay, 50 levels - from very simple to complicated. One of the most successful games of the 8-bit times should be "Boulder remake". One of the most successful games of the 8-bit times should be "Boulder Remake". Here you have to collect diamonds in a maze and you freely admit the way to the exit.Its a great and interesting game with nice interface and nice graphics that can be played be people of all ages. TA3D is a free project whose aim is to remake the engine of Total Annihilation but in real 3D, with perspective, camera management, hardware acceleration ! You must kick out all bricks,and you have three lives per level at your disposal. Arkanoid Unlimited Levels is a Remake of the famous Arkanoid game. All levels in this game are unique (you will never play on a standard game field). You must kick out all bricks, and you have three lives per level at your disposal. Some bricks have bonuses or money. You can collect the money and buy bonuses at the end of each round. This game is barbarians' fighting on swords. 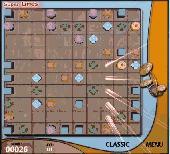 In it you can play in couple on one keyboard, with computer and also look at the fighting of computer's barbarians.